Sharon Thompson is our guest writer this week. She is a well known South Carolina Garden Writer and Speaker. Her articles appear in several Master Gardener newsletters, The State newspaper, Lake Murray-Columbia Magazine and Carolina Gardener magazine. She enjoys speaking to Master Gardener groups and Garden Clubs. For my 60th birthday, I asked for an arbor. My husband was certain I would want some sort of bling to mark the beginning of my 6th decade, and he was right. But I didn’t plan to wear that bling: I wanted it for the garden. We were finishing some porch railings at the time so finding someone to make it was quick. Ordered in May, it was up and running by November. Visions of overflowing vineage welcoming visitors and me danced through the birthday day girl’s head. My 64th birthday is coming up and my arbor vision is a bit blurred: the arbor is still embarrassingly bare. In my defense, I knew that the soil around that arch was poor, even lousy, and very dry: Most plants in that area struggle. The only thing that kept the area from being a total wasteland was my diligence with the hose and compost. The first spring, I planted easy-to-grow annual vines like moon vine and hyacinth bean, but they were laughably puny. I chalked it up to too much shade and not enough attention from the gardener. Year number two, I decided to try a native trumpet honeysuckle, Lonicera sempervirens. This perennial vine is flexible in its growing requirements - sun or shade - and has basic moisture needs. 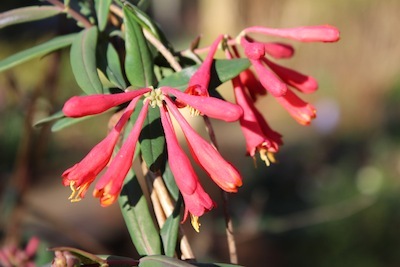 Attractive coral flowers bloom heavily in spring then sporadically throughout the year, attracting all manner of butterflies, insects, and hummingbirds. I thought, "If this vine crashes too, I need to buy some kudzu." The first year, the little plant just sat there, despite the most excellent hole I had dug and nourished with compost and worm castings. The second year, a few rangy stems reluctantly dragged themselves up one pole. The third year a few more stems cast themselves over the cross pieces but it wasn’t until heavy August rains visited the garden that things started looking up, over, and around. Twice in one month, I had to climb a ladder and wrangle errant honeysuckle arms onto the arched frame. Will I regret this vine choice when so many of my other perennial vines have quickly outgrown their original sites? I don’t think so. If all else fails, I know I can cut it to the ground and it will re-sprout with enthusiasm. 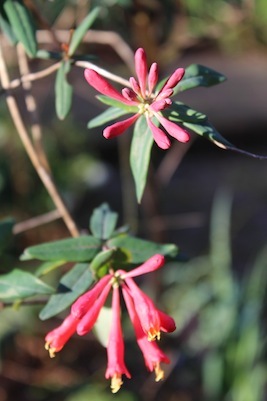 Take your vine chances with native coral honeysuckle. Semi-evergreen in some areas of the country, it is also available in shades of yellow, pink, or red. ‘John Clayton’ is an exceptional yellow selection that blooms heavily several times a year; ‘Cedar Lane’ has distinctive narrow foliage and orange-red blooms. There are many other selections on the market so don’t be afraid to bring one of these easily managed vines into your garden.